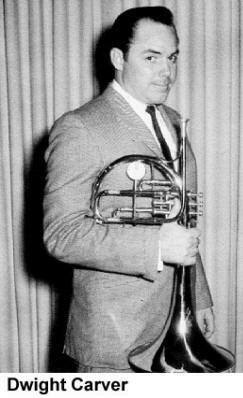 Possibly the most interesting chapter in the history of the mellophone occurred with the Stan Kenton Orchestra during the early 1960s. 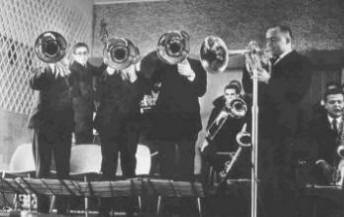 From September 1960 through November 1963, the orchestra prominently featured a four man section of mellophoniums and forever changed the use of the instrument. Stan Kenton started his band in 1941. Through the late 1970s, the Kenton band witnessed a lot of changes in music and in the world that listened to it. Driven by Kenton's eagerness to push the musical envelope, the band continually changed to meet, and often surpass the demands of his loyal, but often fickle audience. 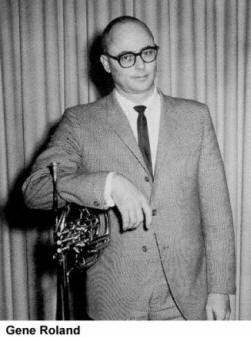 Gene Roland soon became involved with the search for a new instrument for the band. Roland was a noted performer who, during his long tenure with the band played trumpet, trombone, and solo saxophone. His first suggestion to Kenton was for a section of E-flat trumpets, and he even got a section of them together for Kenton to hear. However, the big trumpets sounded too much like trombones to be used in the band. The band needed something completely different. 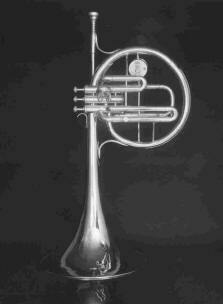 Conn had devised the mellophonium as an alternative for the French horn and mellophone in marching bands. Its ability to project sound effectively and its design for outdoor playing made it quite useful for marching bands. During experimentation sessions involving the entire orchestra (and Gene Roland on the lone mellophonium), the trombone section became very displeased with the addition of the instrument. Once they learned that they could probably expect three more of them very soon, several members of the band decided to end their relationship with the Kenton organization. No less than sixteen people were part of the four-person section during this period. 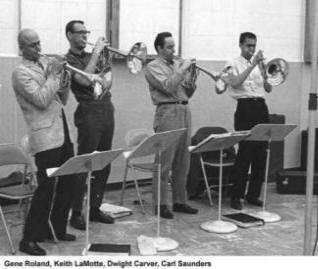 Of these players, all but two were trumpet players (Dwight Carver and David Horton were French horn players). While Carver may have enjoyed playing the mellophonium, it was no secret that many of the mellophonium players wielded their instruments reluctantly. Instead, these players were waiting for an opening in the infamous Kenton trumpet section. Many of these players were encouraged to "pay their dues" in the mellophonium section in order to "move up" to the trumpet section. However, only Keith LaMotte was able to make this coveted transition, partly because it wasn't easy finding people willing to play the mellophoniums. As new players entered the mellophonium section, they were usually shocked by the mellophoniums large bore (.501”) and "sluggish" response compared to the trumpet. Often helpful advice provided to them by the veteran members included tips like: "Keep the bell straight ahead and do your best on the intonation.22 A task wrought with considerable difficulty considering the size of the bell and the great distance of the bell from the player. Especially when the player is mere feet in front of the percussionist. *Note: Plus Gene Roland performing soprano sax and mellophonium solos for recording of Adventures in Blues at these sessions. 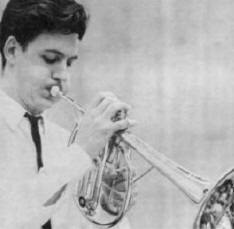 I was in the '63 band, the mellophone band, and the most difficult thing I had to do playing first trombones in that band was to try to estimate where the pitch was going to be with the mellophones. It varied within roughly an octave on any given day! Of all the documented causes of dislike generated by the mellophoniums, one particularly important issue have been virtually overlooked--the issue of "space." Adding four players to a one "bus" band required additional sacrifice from the band members. Seats were made available to the mellophonium players, but there was no room for their instruments in the vehicle's storage area. As a result, the mellophonium cases became a fixture in the bus aisle, symbolically in everyone's way. However, these cases provided convenient seating for the marathon poker games that became one of the most publicized aspects of the Kenton Band. One time we played an NCO club at some air base in Georgia, and we got there early about four in the afternoon, and they had a happy hour. So the band hit the happy hour and a few of us got kinda happy. They had a swimming pool there, so we went to the band bus and got the mellophones out of their cases and throw all four of them in the swimming pool. It was great to see these things burble down to the bottom. Stan came by and he wasn't pleased. We had to drain them all out ­trying to get all the water out of all the plumbing took a long time twisting the things around. Unlike the mellophonium mouthpieces, the cornet mouthpiece had some shallowness to it so you could play high notes. So we bought cornet mouthpieces for all four mellophoniums. Now when we stood up to play solos, we could shriek like elephants!...Stan looked at us as if to ask “Where did those guys get those chops all of the sudden?" We're all trumpet players anyway, so now we got to lay some high notes on the trumpets players. Finally, after a couple of days, Stan came over and looked at the hams and saw the mouthpieces. He was hip" to us and he busted us." He said "put those 'stock' mouthpieces back in, I want that 'French horn' sound!" To say the range of music recorded by the mellophonium band was diverse would be a woeful understatement. The recordings making up over 11 albums from October 1960 through December 1963 ranged from the ridiculous to the sublime. Adventures in Time received a Grammy award and deserved critical acclaim. The album featured prominent solo work from Ray Starling and was the mellophonium band's most daring achievement. Other projects were not as successful. On March 26, 29 and 30,1962, a down-sized Kenton Band recorded an album with cowboy singer Tex Ritter. Stan saw it as an opportunity to end the "bigotry" in music by merging country and jazz. The ensemble, which prominently featured the four mellophoniums, recorded numerous country and western, standards including: Home on the Range, Red River Valley, Cool Water, Empty Saddles and High Noon. 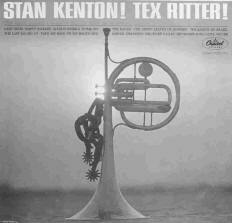 Curiously, following the miserable public reaction to the "Tex" album, Stan followed up with another album one month later featuring another singer. However, this time the singer was songstress Jean Turner and the music was primarily ballads. The mellophoniums had matured into an extremely "tight' section after many miles on the road and many hours in the studio. Mouthpiece adjustments also darkened the horns and solved numerous intonation problems. Combined with some carefully scored arrangements (by Kenton, Lennie Niehaus, Bill Holman), the mellophoniums completely synthesized with one of Kenton's greatest ensembles. 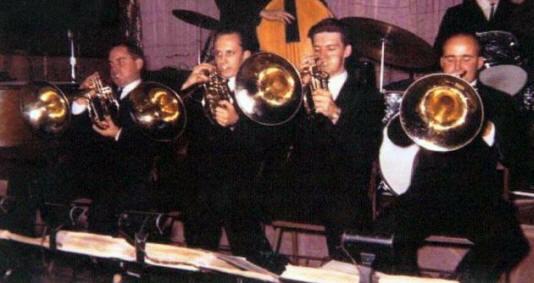 The Stan Kenton Mellophoniums in late 1962 or early 1963 featuring (l to r): Dwight Carver, Bob Crull, Ray Starling, and Tony Scodwell. Reprinted from here. Combined with Turner's lyrical vocal abilities (sometimes eerily similar to Billie Holiday), the album was the most flawless of the entire mellophonium band period. Unfortunately, it was also the last studio recording to feature the mellophoniums. 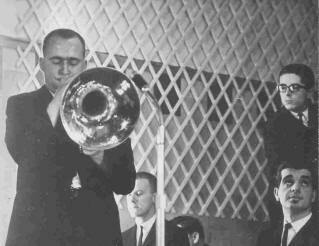 Many of the mellophonium band's last concerts were recorded and are still circulating among Kenton fanatics to this day. These recordings include special scorings of the Kenton "standards" that existed prior to the mellophoniums. Works like Johnny Richard's Cuban Fire Suite, as well as crowd favorites such as Eager Beaver, Peanut Vendor and Intermission Riff also "weathered" the addition of the mellophoniums quite well. Bootleg recordings of some of the concerts including performances in Manchester and a "live" album recorded in Birmingham seem to attest to this fact. The crowds were very receptive to the diverse collection of music presented to them. Although the large ensemble was a definite financial burden on Kenton, it wasn't money that led to the demise of the mellophonium band. It was a judge! Following his divorce from Ann Richards, Kenton was informed that he would lose custody of their two children if he didn't stay off the road for at least one year. Following the tour, the band returned to the U.S. The four Conn Mellophoniums, still the property of C.G. Conn, Ltd., were returned to their rightful owner in Elkhart, Indiana, and immediately tucked away in one of the numerous storage rooms in the large facility. Today, there are occasional performances by "tribute" ensembles featuring the music of the mellophonium period. Often, these ensembles will include French horn players on the mellophonium parts. Most notable of these "tribute" bands is a yearly concert given by the Jazz Arts Group in Columbus, Ohio. This ensemble, directed by Ray Eubanks, has featured some spirited performances of popular and rare music of the mellophonium period. Thankfully, this ensemble often features four marching mellophones. The original Kenton mellophonium players are dispersed across the United States with the highest concentration still located around Hollywood. Most are still playing trumpet, some managed to "get religion" and have enjoyed successes outside music. Although the mellophone was virtually eliminated from the jazz world by the late 1960s, replaced by the less temperamental flugelhorn, legions of mellophone players began to appear in marching bands and competitive drum and bugle corps across the world. The mellophonium is still being manufactured today in the U.S. and throughout Europe. However, the mellophonium and mellophone have still not been accepted as legitimate instruments in the music world. Micah Ewing, what a good idea! ; Ted Daryll of Ted Daryll Productions, how about another mellophonium re-release? ; Lillian Arganian; Tony “The Provider" Agostlnelli, overlord of the greatest "Network" of people on the planet,. Joe and Babe Urso, we made the deadline! ; Margaret Downey-Banks, my idol, Robert Crull, see you at the Bloomington show! ; Tony ScodweII, a legend; Jo Lea Starling, good luck in Europe! ; Bill Lichtenauer, I'm ordering two tickets for JAG '94 next week! ; JoeI Kaye, keeping the dream alive with his own section of mellophones; Bob Curnow, "Remember the Mellophoniums! ;" Sherm Wilkinson and Robert Fitzner, thanks for the quick response! ; Douglas Hughes, this one's for you!!! ; The Murray State University gang and Dr. Jack Dressler, one of the few French horn people that actually reads this rag; Rush Limbaugh, thanks for the encouragement, and, lastly, the Kenton Mellophoniums, you took a chance and created something beautiful You guys will never know how many lives you have changed with your "horns of scorn." Please know that as long as drum corps mid-voice sections roam the earth, your story will be shared with each new generation. 1 Dr. William F. Lee, Stan Kenton: Artistrv in Rhythm (Los Angeles: Creative Press, 1980) 275. 2 Stan Wooley, "Gene Roland," Jazz Journal International November 1982: 16. 3 Dr. William F. Lee, Stan Kenton: Artistrv in Rhythm (Los Angeles: Creative Press, 1980) 276. 4 Stanley Sadie, ed. The New Grove Dictionary of Musical Instruments (New York: Macmillan Publishers Limited, 1984) 473. 5 Margaret Downey-Banks, personal interview, 7 April 1993. 6 82nd Annual Report Year Ending 04/30/57. (C.G. Conn, Ltd., 1957) 6. 7 CONN-vention Extra. July 15, 1957. 8 CONN-vention Extra, July 15, 1957. 9 Dr. William F. Lee, Stan Kenton: Artistrv in Rhythm (Los Angeles: Creative Press, 1980) 276. 10 Jurgen Wolfer, "Johnny Richards Discography, IARC Journal January 1986, 44-45, April 1986, 46-48. 11 Dr. William F. Lee, Stan Kenton: Artistrv in Rhythm (Los Angeles: Creative Press, 1980) 276. 12 Speaker unidentified, Panel discussion in Newport, California, 30 April, 01 May, 1991. 13 Speaker unidentified, Panel discussion in Newport, California, 30 April, 01 May, 1991. 14 Doug Hughes, letter to author, 18 March 1993. 15 Carol Easton, Straight Ahead. -(New York: William Morrow & Co., 1973) 209. 16 Joel Kaye, personal interview, 19 April, 1993. 17 Joel Kaye, personal interview, 19 April, 1993. 18 Joel Kaye, personal interview, 19 April, 1993. 19 Joel Kaye, personal interview, 19 April, 1993. 20 Joel Kaye, personal interview, 19 April, 1993. 21 Jim Knight, Panel Discussion-audio tape, Newport Beach, CA June 30-May 1, 1991. 22 Robert S. Crull, letter to the author, 8 April 1993. 23 Carol Easton, Straight Ahead. (New York: William Morrow & Co., 1973) 208. 24 Stan Kenton: The Man and his Music., Lillian Arganian., Artistry Press, p. 84. 25 Carol Easton, Straight Ahead. (New York: William Morrow & Co., 1973) 208. 26 Carol Easton, Straight Ahead. (New York: William Morrow & Co., 1973) 208. 27 Keith LaMotte, Panel discussion in Newport, California, 30 April, 01 May, 1991. 28 Stan Wooley, "Marvin Stamm," Jazz Journal International, March 1991. pp. 14, 15. 29 Doug Hughes, letter to the author, 18 March 1993. 30 Stan Wooley, "Marvin Stamm," Jazz Journal International. March 1991. p. 15. 31 Carol Easton, Straight Ahead, (New York: William Morrow & Co., 1973) 211-212. 32 Dr. William F. Lee, Stan Kenton: Artistrv in Rhythm (Los Angeles: Creative Press, 1980) 293. 33 Robert S. Crull, letter to the author, 8 April 1993. 34 Tony Scodwell, personal interview, 23 February, 1993. 35 Robert S. Crull, letter to the author, 8 April 1993. 36 Robert S. Crull, letter to the author, 8 April 1993. 37 Tony Scodwell, personal interview, 23 February, 1993. 38 Tony Scodwell, personal interview, 23 February, 1993. 39 Margaret Downey Banks, personal interview, 7 April, 1993. 40 Stan Kenton: The Man and his Music., Lillian Arganian, Artistry Press, p. 184. 41 Ted Daryll. Stan Kenton: A Retrospective Compact Disc Liner Notes, (Hollywood: Capitol Records, 1992).